Italy, the home of fine arts, beautiful landscapes and some of the best food straight out of nonna’s kitchen. Our time in Italy was spent in awe over the sights, appreciating the history, and of course stuffing our faces with some of the best food we’ve ever eaten in our life. 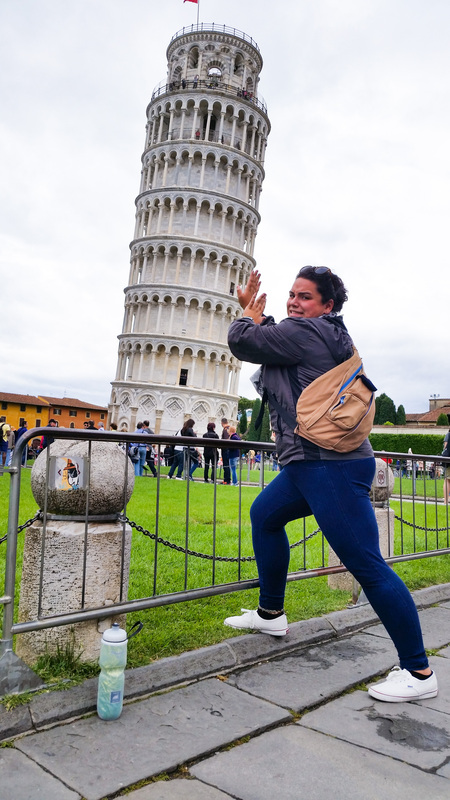 It was a filling experience (literally) and now that we’ve left it is time to drop the next addition to the “Tips and Tricks Series” so here you have it folks, Tips and Tricks for Italy. During my time spent here we visited Pisa, Cinque Terre, Florence, Rome and Venice. Rather than breaking each set up of tips based on region I’m going to lump them all together because they ran true for each place we went to. This tends to be the common attitude when talking to most travelers. Every once in a while you’ll hear a story where someone gets stopped and they get threatened to be fined or have the cops called, but more often than not it usually ends with them playing “dumb tourist” and getting off with it, so if you’re strapped on cash, skip the ticket altogether. So skip paying for a public transportation pass altogether. What I’ve come to realize while in Europe is that in some countries nobody will even check if you have a ticket. So while in Europe I rode the trams and busses with no tickets in 2 different cities on 4 separate days, never once was I asked for a ticket and after the first pass I quickly realized that I wouldn’t really need them from here on out. Well for Venice they would try to justify it saying that you could also use the water taxis which can be a nice experience in itself. But in actuality, unless you plan on visiting the different islands (Murano for glass blowing or Borano for lace) then you can absolutely walk all of Venice with little to no problems. Well, aside from getting lost often but that’s what you’re supposed to do while in Venice! In a lot of the cities we visited they would offer some kind of deal where you could ride all forms of public transportation for a set amount of days. Each region has a different pass and each pass is a different amount. In Rome, the Roma Pass would allow you to ride any form of public transportation for 7 EURO. Whereas in Venice, you could buy a one day public transportation pass and it would run you 20 EURO. That’s right, you heard me one day pass to get you into the heart of Venice would cost you 20 EUROS, that seems outrageous right?! Sure it is not a well-kept secret and there will be people taking their newest profile pictures with their selfie sticks but there is a reason why so many show up…because it is the best. The colors of the buildings embraced the setting sun and reflected off of the river passing through the Ponte Vecchio. It was what you would expect from a Tuscan sunset and the sky was filled with hues of gold, purple, pink, orange and blues. I felt as if I had tripped and fallen into the paintings that peddlers sell on the street. Except this was real. So grab yourself some good cheese and an even better bottle of wine and brace yourself for one of the most romantic sunsets you’ve ever seen. Florence has a skyline that you could easily recognize similar to that of NYC or London. But that skyline never shows itself in a prettier light than when the sun is setting over it. 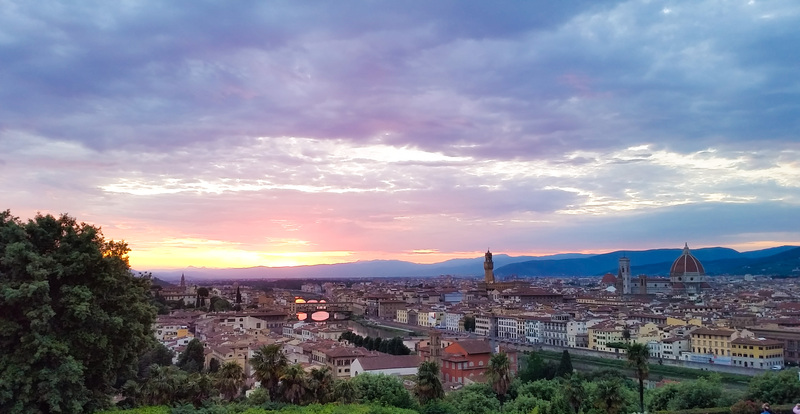 One of the best places to get a perfect panoramic view of the sun setting over Firenze is Piazelle MichelAngelo. Everybody seems to know this too, once it gets closer to 8pm people start to trek up the hills of Florence and make their way to the plaza. The place is so small that there’s nowhere for you to sit so your best bet is to grab your bearings and walk an extra 5 minutes towards the coast. Here you’ll find people with the same idea as you bringing their lunch to enjoy by the ocean front. So sit back and enjoy your yummy lunch and watch as boats sail through the northern Italian coast. This is one for the books people. Peeking inside you will see the biggest pizza slices you’ve ever seen all baked on their homemade focaccia bread. It is a symphony of food and your eyes will dance trying to decide how NOT to order them all. Make sure you grab a piece of focaccia to go with your pizza because it is seasoned with sea salt, garlic, butter and herbs and still warm when this heaven reaches your lips. Each village has its own charm and they all have restaurants and cafes that make your mouth water when you walk by and whatever they’re cooking lingers in your nose. But if you want a quick cheap lunch that will knock your socks off then look no further than Batti Batti in Vernazza. 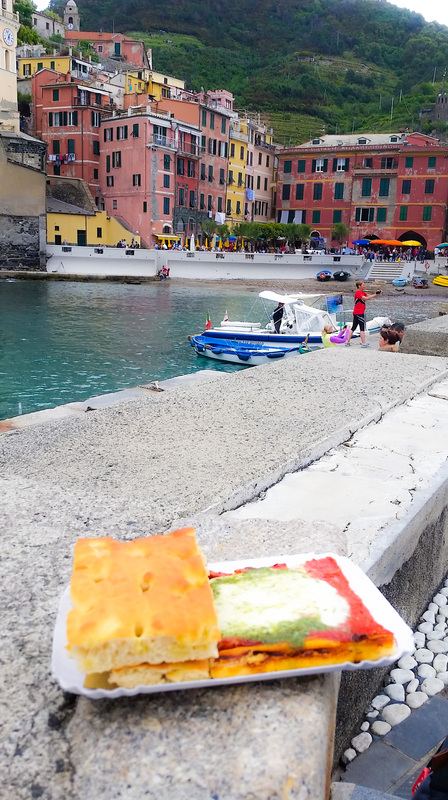 This foccacerria is hailed by travelers and guide books as being THE place to visit in Vernazza and it’s easy to tell why. In an unmarked building you’ll see a line forming out of the door at lunch time and you know you’ve found the right place. But all that only adds to its Italian Riveria charm. There are lemon and orange trees scattered all throughout their islands. The cutest old ladies tend to their grapes anticipating when they will harvest them for wine. Then the buildings are painted in various shades of maroon, pinks, tangerine, and yellows. Here you can get a taste of the old country and make you remember a time before smart phones and social media existed. Cinque Terre is quickly becoming a location that needs to be seen when visiting Italy and it is easy to see why. These five villages are strewn together by two rails, some ferries (only in the summer months) and countless trails. Unless you live there don’t even think about bringing a car anywhere near these villages. A meal with a view for less than 5 euros, yes please! That is, unless you are willing to pay. Gladiators will gather in front of various tourist attractions (i.e. The Colosseum, the roman forum, and pretty much everywhere in Rome). You think, “OMG, how fun would this picture be of this gladiator lifting me in front of the Colosseum, so old school Romeeee”. Yeah no, they’ll do that but then these scruffy overweight gladiators will ask you for some kind of payment quicker than you can upload it onto Instagram. Now don’t get it twisted, if you do end up taking a picture with them you don’t need to break the bank paying them, 50 cents or a euro is perfectly sufficient. Same goes for the accordion players. These guys are tricky, so while sitting eating lunch in Rome one day I saw this amazing accordion player saunter over. He stood in front of a café and I thought “Oh wow, this is some classy stuff, this café has an accordion player serenading people while they sip on their espresso.” How wrong I was, I headed over and this man played me the prettiest love song. I of course got out my phone and started to record him, big mistake Chantel. At the end of his song he saw me recording popped off his hat and demanded that I then payed him. I totally got dupped, but I forked over my euro, and in all fairness, I loved every second of it and he was amazing so he deserved the little bit of money I had to offer. So many times in our 21st century first world lives we forget to look up from our smart phones and experience all that is around us. Well you need to keep this in mind if you take the train anywhere period. But especially so for Italy. There is nothing prettier than riding through the Tuscan countryside on a beautiful day at 110 mph. These sights are like nothing a lot of us have ever seen and for that reason they deserve to be appreciated with you putting your phone down. There you have it guys, I hope these tips come in handy the next time you plan to visit good ole’ Italia.